As a PE teacher, I sometimes find myself teaching the same skills and lessons each year. 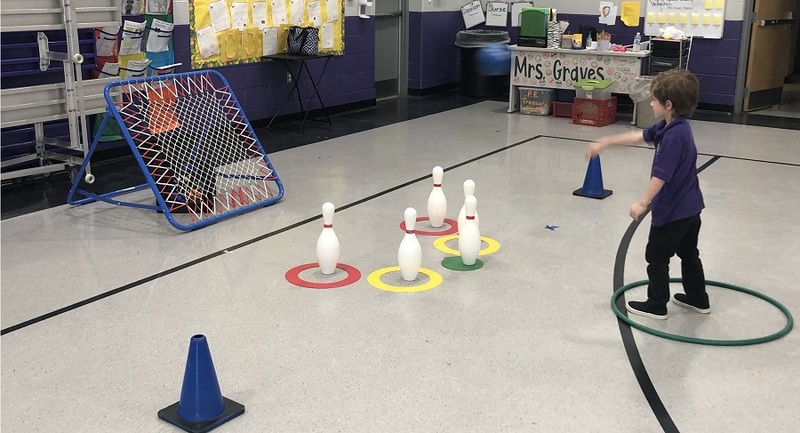 Teaching some of these lessons to all K-5th grade classes can get a bit repetitive, so I set out to find something new to share with my students to start out or end the school year and get them excited for PE. I had previously seen ideas on social media for Jumbo Jenga and Jumbo Kerplunk, and always wondered how I could incorporate those games into my PE classes. With those ideas in mind, I came across an inflatable bowling set as well as an inflatable field goal post with a football included. With these two additional activities, I came up with the idea of teaching a Jumbo Games Unit! This unit had a total of 4 activities, and was setup in a station format. I had groups of 4-6 students at each station and each group participated in the activities for approximately 6 minutes each. You might decide to build this yourself if you are on a budget, or save time and order Jumbo Jenga online. I also decided to add a fitness twist to make the game more active. I took each block and wrote down an exercise that would be easy for my students to read and understand. These were also exercises that I had previously taught in class before, and reviewed the day of this lesson. Examples include “5 Push Ups”, “20 Second Wall Sit” and “5 Curl Ups”. Game Rules: Students would take turns taking out a block, without allowing the tower to fall, and all students in the group would perform the exercise together. Once the exercise was complete, the next student would take out a block and the group would again perform the exercise together. My students really loved this activity and I often found them counting loudly as a team and helping each other remember how to properly complete each exercise that was chosen. *Safety Tip: When explaining this game, I was always sure to tell my students to stay on their feet while trying to take out a block, as opposed to kneeling down on the ground where the tower of blocks could potentially fall on top of them. *Setup Tip: I found that putting a sturdy gymnastics or yoga mat down cut down on the noise of the blocks falling and hitting the gym floor. It also will help protect the wooden blocks from splitting/breaking. Jumbo Kerplunk is another game you can either purchase or build yourself! I used a laundry basket I found at a local store that reminded me of the game, and I found various sized dowel rods in the craft section. I tried out different sizes until I found the size that I felt would work best (5/8 inch). Instead of allowing the balls to fall to the ground, I used a smaller laundry basket to go underneath the larger one, and cut a rectangular hole on one side of the basket to give students access to the balls as they fell. Then I found the plastic pit balls at S&S Worldwide. In order to incorporate this game into my PE classes, I wrote various exercises on each ball with a wet erase marker. Some balls have a question mark, which means that the student who chose the ball can choose the exercise that the group completes. Game Rules: Students take turns taking out a dowel rod. If a dowel rod was taken out and none of the balls fell, then the group did not have to perform an exercise. If a dowel rod was taken out and one or more balls fell, then the student who removed the rod would reach into the hole on the side of the laundry basket and choose one ball. The entire group would then perform the exercise that was written on that ball. Once the exercise was completed, the next student would choose a dowel rod to remove. Students loved the anticipation of whether or not a ball would drop and whether they would have to complete an exercise or get a break. *Setup Tip: I placed the game inside of a baby pool to keep the balls from rolling around on the gym floor. I also had a designated place for the dowels to go (large bucket) after they were pulled out to help eliminate the risk of injury if students were playing with the dowels while waiting their turn. 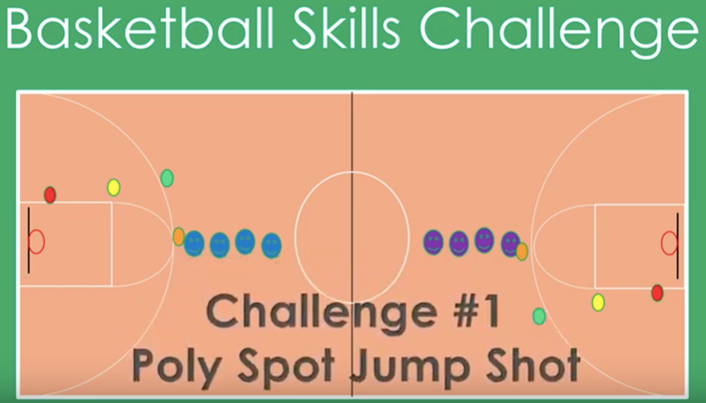 *Teacher Tip: I found myself at this station the majority of the time because in order to set the game up correctly (and quickly) after all the balls had fallen, I had to do it myself. 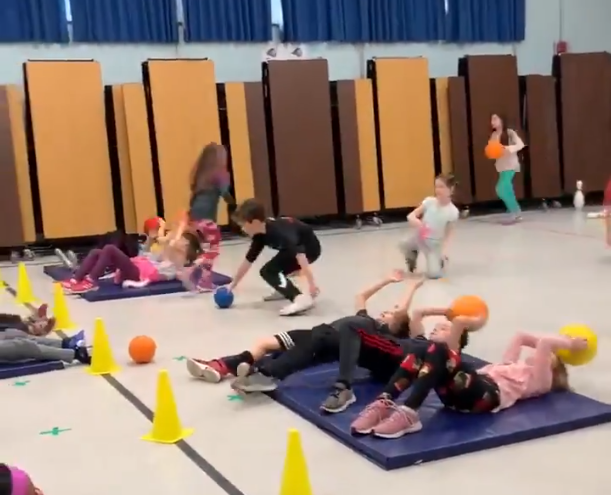 During the time that I was setting up the game, students individually chose a ball and completed the exercise on the ball so they were not standing around waiting. Inflatable Jumbo Bowling & Inflatable Jumbo Football were the final pieces to my Jumbo Games Unit. It was helpful to have two sets of each game so that I would not have too many students waiting for their turn. 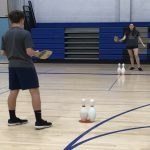 Game Rules (Bowling): I allowed each student to have two turns to roll and knock over all 6 bowling pins, much like regular bowling. Students who were waiting their turn helped to reset the game after their partner’s turn was over. Game Rules (Football): Each student got one try to kick the football through the field goal post. They would then retrieve the ball and give it to the next person in line. *Setup Tip: I used a combination of a ball pump and a shop vac to inflate all of the equipment. Overall, my students really enjoyed this fun and different PE lesson. The minute they walked into the gym and saw the Jumbo Games setup, they were instantly hooked and ready to get started! I hope you consider creating your own Jumbo Games Unit in the future! Lindsay Dillon is a PE Teacher at Pleasant Knoll Elementary School in Fort Mill, SC. She is currently going into her 8th year of teaching Physical Education. Lindsay’s greatest accomplishment was being voted for Teacher of the Year by the staff at PKES. She enjoys organizing the After School Staff Wellness Program as well as Family Fitness Nights for students and their families. Lindsay and her husband Bryan have a sweet and energetic 5 year old named Kenzie and are expecting a little boy, Blake, in August. 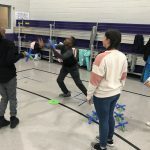 This entry was posted in PE Activities & Games, PE Central and tagged jumbo games, Jumbo Games unit, jumbo inflatable games, jumbo jenga, jumbo kerplunk, Lindsay Dillon, PE activity, pe class, PE games, PE lesson plan, pe teacher, Physical Education by Guest Blogger. Bookmark the permalink. I added jumbo OPERATION game to my GIANT FIELD DAY. I would like to send a picture of it for others to design. It was a blast. How can I send in a picture. Hi Jean, we would love to see photos of your Jumbo Operation game. What other games did you have for your Giant Field Day event? We are always looking for field day ideas to add to our Field Day Downloads, if you would be interested in writing something up for that? You can email us at [email protected]. Thank you!